Mention Increase Allen Lapham and you’ll get a mixed response. His first name is unusual enough to be intriguing, confusing, and forgettable. The last name is associated with so many different things it has lost connection with the man and his story. 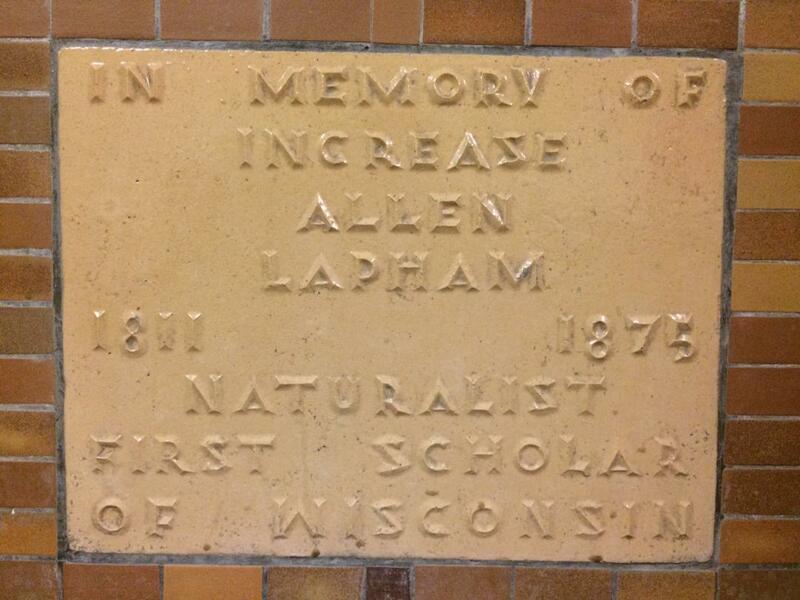 Increase Lapham is called things like “Wisconsin’s first scientist” or the “Father of the U.S. Weather Service.” Plants, a trilobite, and meteor markings are named for him, as are streets, parks, and even a WWII U.S. Navy ship. I have always thought it was too bad that his story isn’t more commonly known, especially among those of us living in ‘his’ neighborhood and for the many kids who proudly sing ‘his’ school anthem. Increase was born in 1811. He was an explorer and tinkerer who was full of delight and appreciation for the land that we now know as Wisconsin. He had a respect for ecology, the Native heritage, and our place in the universe that was unusual for his time. He moved to the Milwaukee area twelve years before Wisconsin became a state and immediately directed his curiosity and his skills in observation to understanding the region. He wrote the first book written and published in Wisconsin. He studied and wrote about the geography, topography, history, geology, mineralogy, natural history, trees, conservation, soil, and ‘antiquities’ (Indian mounds) of the region. 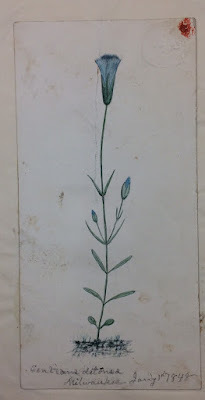 He was a man of endless curiosity who drew the flora and fauna of the area with beautiful precision, who surveyed the land and made the first maps of the area, who discovered mounds and archeological sites in the region, and who marveled at everything in the natural world. Increase called himself a citizen scientist. He didn’t have a college degree, but he was interested in trying everything. Much like your typical elementary school student! When I moved to Wisconsin to work for a state-wide cultural organization, I had to get caught up on the people and places of the region’s history. That’s when I met Rob Nurre, an enthusiastic expert on Increase Lapham. My first daughter started kindergarten at Lapham Elementary School in 2015, 110 years after it was dedicated in honor of Increase Lapham. Rob is the one who told me that Increase’s daughters, Mary and Julia, annually donated something from the explorer’s collection to the school on March 7th, his birthday. One year they gave the school one of his microscopes. These items all ended up as part of the enormous Lapham collection at the Wisconsin Historical Society when the school closed briefly in the 1980s. Currently there is only a small plaque above a bubbler in the school memorializing Wisconsin's first scholar. It is made of tan ceramic and is hard to read, if you even notice it. My kids are not impressed by this boring sign and I agree: it doesn't really speak to Increase Lapham's playfully curious character. 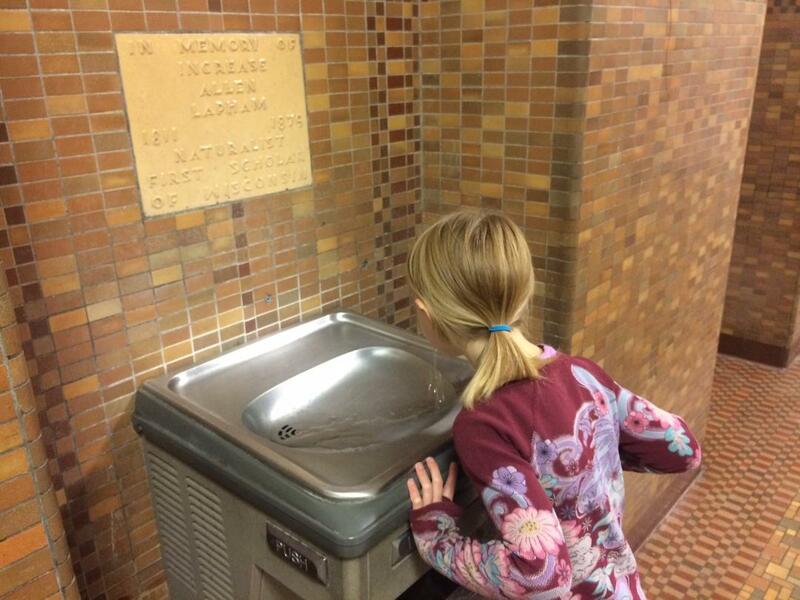 Here is where the story takes a modern turn: This spring every kindergartner, first and second grader at Lapham Elementary School will make a personal acquaintance with Increase Lapham. Hopefully that antiquated first name will start rolling off the tongues of neighborhood children (and their parents)! Increase Lapham will spend a day visiting each classroom! Rob Nurre, dressed in period clothing and with pockets filled with trilobites, rocks and other curious bits from the natural world, will come in character to talk with students about the world of Wisconsin in the mid-1800s. An exhibit about Increase Lapham in the school hall will help students, teachers and parents get to know the curiosities and achievements of this influential Wisconsinite. It will include images of Lapham, copies of some of his drawings and journals, as well as the kinds of scientific and artistic tools he used. Students will make special notebooks to record their observations on the natural world. Modeled after Lapham’s own notebook held in the Wisconsin Historical Society collection, a little pocket in the front of the notebook will hold a magnifying glass. Fact sheets will be pasted inside the cover of the book. Guest artist Amy Mietzel will spend two weeks in the art classroom to help each student decorate and customize their notebook. Information about Increase Lapham’s interests and studies will be provided to all teachers so they can make connections within their lessons. For example, in music class students will to compose lyrics to a song connecting the dots between life as a Lapham student and the endless curiosity that leads to a life of learning. The Gardener-in-Residence will help the students use their notebooks to record observations in the garden. Increase Lapham was interested in and influential in so many spheres, the story has many entry points. There are fun ways for Kindergarten, first and second grade lessons to connect to his studies and accomplishments. For example, my second grader observes the weather every evening and records the data. My kindergartner made binoculars in art class. Now they might also come away from their time at Lapham Elementary School proud that they, like Increase Lapham, are citizen scientists. And curious about all there is left to explore around them!